SIX NATIONS — Week Six of the Women’s ALL Division finalized last Saturday, with no changes in standings for any of the teams. The Paris RiverWolves still rest on top with the St. Catharines Shockwave just below, and the Six Nations Lady Snipers and Whitby Steelhawks close behind. However, the Shockwave are only behind the RiverWolves in points earned per game, not wins or losses which almost ties the two for first place. As entering the first game of the day on a win streak, the RiverWolves were given a hard go against the Shockwave as they were missing key players on the bench. The Shockwave were stacked on the other hand and took full advantage, ending their match 4-3 and delivering the RiverWolves their second loss of the season. 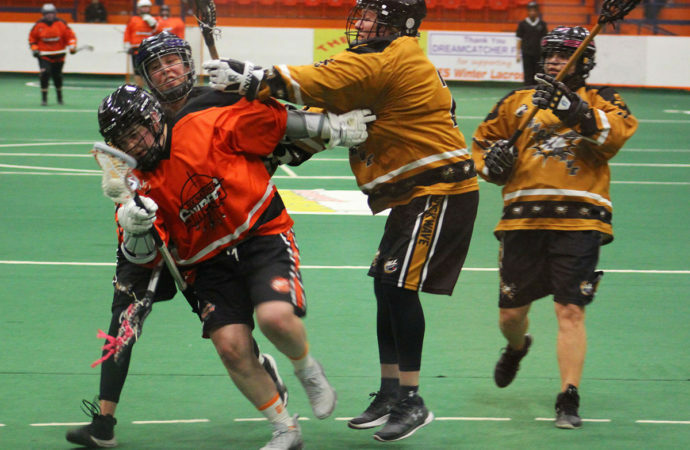 The second game brought the Snipers and Steelhawks together, but with the Steelhawks showing more improvement on transition and more gumption on offence. This gave them the first unassisted goal of the game. However, the first period allowed the Snipers to bury four in a steady assault on the Steelhawks goalie; one from Kenley Jacobs from Mia Martin, an unassisted goal from Mal Bomberry, another from Mia Martin and an unassisted rip from Amber Hill. The second period opened for a blitz from Brie Tremblay, who scored twice from Madison Vonhanke, Miranda Vonhanke, Mekwan Tulpin and Mia Martin. Soon to follow was Amber Hill with her second bury from Lauren Hill. The third period allowed only one goal for both sides as scrambling for ball possession went throughout the period. This goal came from Mia Martin who broke off of the bench and shot from the outside on the fly after a pass from Mekwan Tulpin. The fourth period allowed the Steelhawks a bit more leg room on offence and they buried twice more before the end of the period. However, the Snipers kept a steady pace after the slow third. Tyra Skye scored off of a pass from Brie Tremblay and Amber Hill scored a hat trick from Brie Tremblay. Quick to follow up was Brie Tremblay with her own hat trick from Amber Hill and the final goal of the game from Mia Martin for her third. This ended the match 9-3 for the Snipers. 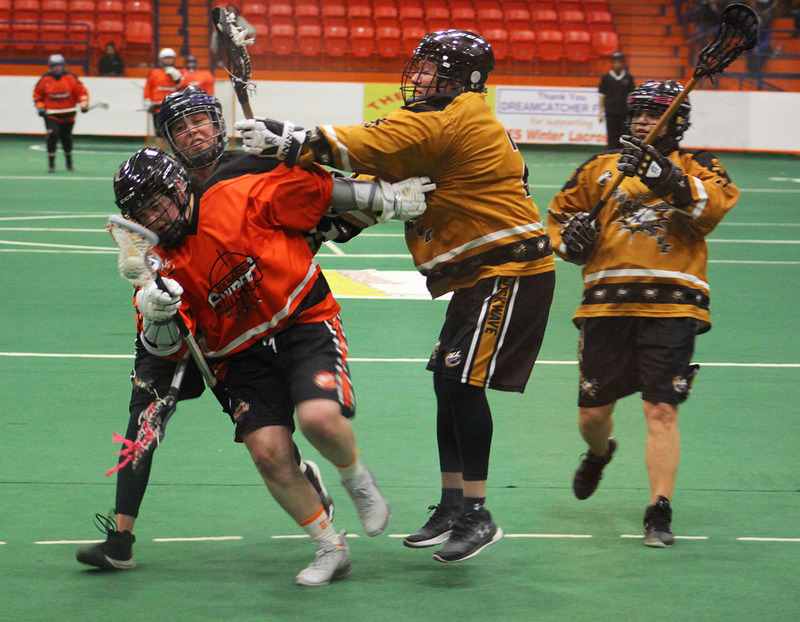 However the next game was an oddly close one for the RiverWolves who matched up with the Steelhawks. Rather than running the scoreboard, the RiverWolves won by a mere three goals with a final of 8-5. For the final game of the day, the Snipers met with the Shockwave. But rather than seeming to let the game run its course as thy have in the past, the Snipers seemed eager to compete as their bench was full of more hometown players. Mal Bomberry broke the scoring in the first period from Miranda VonHanke and Brie Tremblay. But also closed the scoring for the Snipers in this period, as the Shockwave took the lead 2-1 by the end. The second opened up a lot of scoring opportunities for both sides with goals from Mia Martin and Miranda VonHanke at the start. However, the Shockwave were quick to answer, but Mekwan Tulpin scored two in a row from Mia Martin and Mal Bomberry to close the period with a tie. The third allowed the Shockwave a two goal lead as the Snipers couldn’t connect with the back of the net, and began the fourth with a deficit. Mekwan Tulpin earned her third after a pass from Lauren Hill and Miranda VonHanke scored her third from Mia Martin and Mal Bomberry to close the period. This ended the game with the Shockwave on top 7-9, but showed hard work on both sides. The results or dates for the battle for the ALL Women’s Cup have yet to be announced.